We have year-round commitments from many European cities on charter flights "shared" by a number of tour operators. 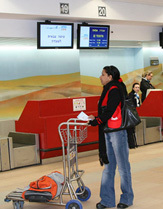 In addition, during certain periods we also operate our own flights from the UK, France, and Italy to Tel Aviv and Eilat. We can thus offer these charter seats to individuals and groups coming from Europe to Israel. We also operate special flights on demand for large groups from major and secondary airports all over Europe. The product offered will depend on the nature of the group. For example: we have a lot of experience dealing with VIP football requests. Our proven ability to sell the "empty legs" in the Israeli market means that we can often provide cost-effective solutions.